Philippine Airlines (PAL), is the Philippines's national airline carrier and is also the 1st commercial airline to take off in Asia. The airline's corporate headquarters is centred in Makati City. With its main base located in Manila's Ninoy Aquino International Airport at the city of Parañaque, Philippine Airlines flies to over 20 domestic airports within Philippines and to 30 cities across three continents. 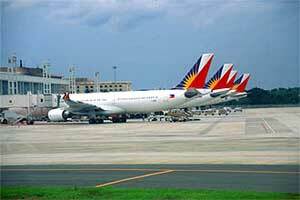 The airline's 2nd hub is the Mactan-Cebu International Airport. Philippine Airlines launched its new cabin class service called PAL Econolight Class. The cabin class which is targeted to the budget segment market will serve both domestic as well as international flight destinations. 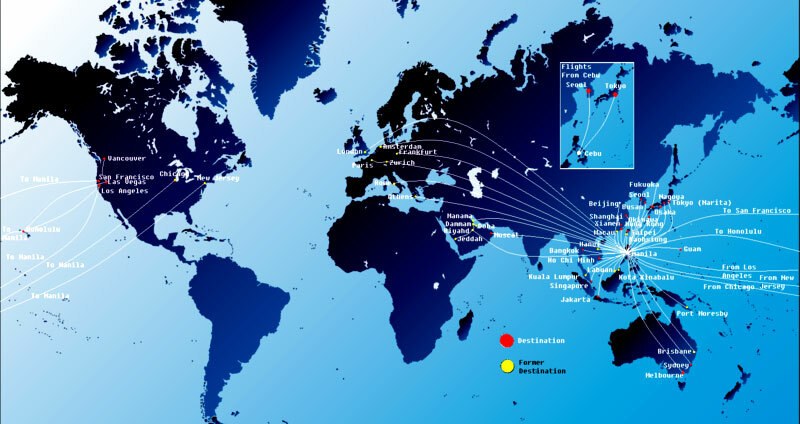 Across the globe, PAL operates within the Asia-Pacific region with 24 daily internatinal flights and also to long-haul destinations which includes the United States of America and Canada being marketed at a large scale. An extensive domestic network of several flights per day between Manila and other Philippine cities. The airline used to fly to New York, Europe and the Middle East but due to the rising fuel prices and also financial difficulties forced the airline to terminate those services. PAL signed a memorandum on July 27, 2007 which launched flights to the southwestern Chinese metropolis of Chongqing with the use of the Chongqing Jiangbei International Airport. Frequent Flyer Programme : Mabuhay Miles. Members can redeem points which they earn. Mabuhay Miles Base, Elite, Premium Elite and Million Miler.